In July 2017, Tuma Basa, the global head of hip-hop at Spotify, declared the “gatekeeper era” a relic of the past. “My job is not a bouncer to keep people out or to kick people out, it’s to get people in,” said Basa to Billboard. “It’s to get the right people in and to keep the party popping.” That’s an odd distinction considering the press surrounding Basa’s signature RapCaviar Spotify playlist: New York Magazine described it two months later as “the most influential playlist in music….which turns mixtape rappers into megastars. And it’s all curated by one man.” A gatekeeper if there ever was one. Right now streaming services like Spotify are hoping to revive an industry that’s spent decades on the decline due to exploitative consumer practices (ever wonder why albums costed so much in the 90s?) and continues to struggle adjusting to an internet world. 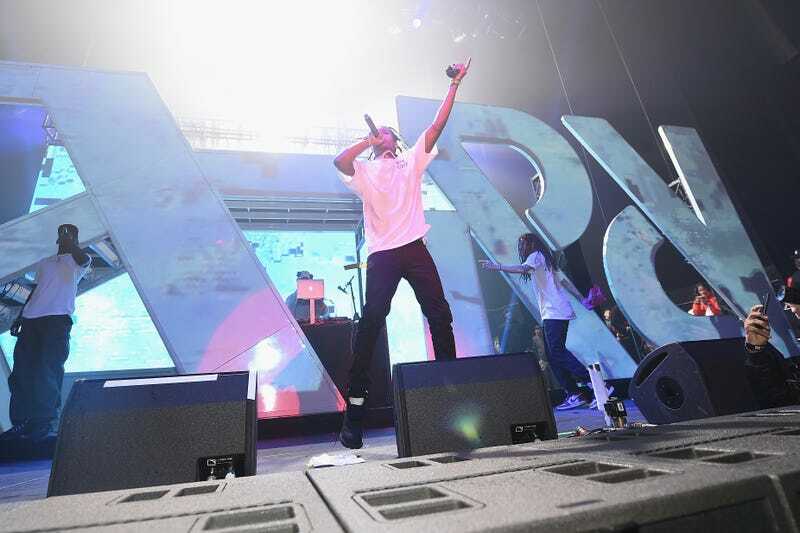 A genre disproportionately benefitting from this new era is rap: As Forbes reported earlier this year, it finally overtook rock as the United States’ most popular form of music. The increased value of streaming and rap’s sudden prominence places great power in Tuma Basa’s weekly RapCaviar selections. Once again for the people in the back: one man, and the most important playlist in music. RapCaviar, over the last couple of the years, has ballooned to over eight million followers that guarantees hundreds of thousands of plays to any artist who gets placed on it. It is so successful, Spotify began marketing the playlist with massive billboard campaigns, video features and most recently, a live concert series, something previously unheard of. According to information provided by Chartmetric, a site devoted to streaming music analytics, 43.1% of songs added to RapCaviar in 2017 are added to the playlist the same day they’re added to Spotify, compared to only 13% on the service’s biggest playlist Today’s Top Hits. That means major labels and big shot managers have already pitched and sent music to Basa and Spotify well before consumers even know it exists. Expand that purview to two weeks since initial upload and the number is a staggering 65.4%—meaning, the majority of RapCaviar’s music was uploaded to Spotify within a narrow two week window. For major label artists, and much less for truly independent acts, if a track isn’t up on RapCaviar within that initial month of release, better luck next time. “The amount of information I have, I almost feel like I’m cheating,” Basa told Billboard earlier this year. “What the audience wants is all right there.” Music the audience wants, he assures, is two-thirds of which they’ve never heard. So what about non-major label artists? According to additional data provided by Chartmetric, the opportunity for independent acts to get on RapCaviar is next to impossible. Less than 13% of acts without any major label affiliation make it on to the playlist. The next best thing for those artists is to attempt to score a slot on smaller hip-hop playlists like Most Necessary or Get Turnt, but unlike other playlists that often funnel upward, there’s no direct path onto RapCaviar...unless you can whisper directly into Basa’s ear. Sadly, many of the wholly independent acts (aka, no major label or management affiliation) who were able to break onto the playlist in 2017 were rappers like Tay-K, who is currently under arrest for murder, and XXXTentacion, who is facing serious charges of sexual assault and false imprisonment. Far less troubling artists Stormzy, Phresher, and YBN Nahmir snuck onto the playlist, but most slots are filled with established acts like Future, Migos, and Kendrick Lamar, whose songs auto-place on RapCaviar immediately once uploaded to Spotify. If the space for independent artists is so narrow, you’d hope it’d widen—and go to artists without abuse allegations leveled against them. Beyond RapCaviar, Spotify’s impact on the music industry is increasingly impossible to deny, with a global user base of 140 million, 60 million of which are paying subscribers. Just last month, the Wall Street Journal referred to Basa a “gatekeeper,” even if it’s a term he continues to deny. But all of the attention given to Spotify playlists and RapCaviar, specifically, doesn’t seem to have much of an impact on rap’s artistic outpouring itself: According to Genius, a site dedicated to obscure rap facts and data, no rapper has ever mentioned the premier playlist in a song. The press narrative declares it makes hits, but those behind microphones operate without much concern for its influence. Perhaps that will change as RapCaviar grows. Streaming platforms with lower barriers of entry, like Bandcamp, SoundCloud, Spinrilla, and YouTube, continue to act as places where independent rap can prosper on its own terms. Spotify and Apple Music are so much under the thumb of major labels, they can provide a good look for an emerging act (assuming the musician in question has managed to secure a prominent spot on those networks) but those artists should—and can!—look for other ways to push their career forward, beyond a single song on a single playlist. Most rappers will never make it onto RapCaviar, but the underground will always find ways to be heard.